This page shows results found in the literature for several person re-idenfication datasets (sort by rank-1 CMC). If you like to have your published results added in the following tables, please send an e-mail to Raphael Prates with the link (or the pdf) to your paper and the results to be reported. Up to now, we have tabulated the results for the following datasets. We have released the codes that implement our works (see the list below). Some brief description, CMC-curves and the link to download are available in the following links. (*) We are sorry to inform that our previous results have a bug in the code. We update the results as well the code (we included the feature extraction). Raphael Prates, William R. Schwartz, “CBRA – Color-Based Ranking Aggregation for Person Re-Identification,” in IEEE ICIP, 2015. Sakrapee Paisitkriangkrai, Chunhua Shen, Anton van den Hengel, “Learning to rank in person re-identification with metric ensembles,” in IEEE CVPR, 2015. Ying-Cong Chen, Wei-Shi Zheng, Jianhuang Lai, “Mirror Representation for Modeling View-Specific Transform in Person Re-Identification,” In IJCAI – International Joint Conference on Artificial Intelligence, 2015. Zhiyuan Shi, Timothy M. Hospedales, Tao Xiang, “Transferring a Semantic Representation for Person Re-Identification and Search,” in IEEE CVPR 2015. Shengyong Ding, Liang Lin, Guangrun Wang, Hongyang Chao, “Deep feature learning with relative distance comparison for person re-identification.” Pattern Recognition, Volume 48, Issue 10, October 2015, Pages 2993-300. Shengcai Liao, Yang Hu, Xiangyu Zhu, and Stan Z. Li. “Person Re-identification by Local Maximal Occurrence Representation and Metric Learning.” The IEEE Conference on Computer Vision and Pattern Recognition (CVPR), 2015. Xiaokai Liu, Hongyu Wang, Yi Wu, Jimei Yang, and MingHsuan Yang, “An ensemble color model for human reidentification,” in IEEE Winter Conference on Applications of Computer Vision, 2015. Shi-Zhe Chen, Chun-Chao Guo, Jian-Huang Lai. Deep Ranking for Person Re-identification via Joint Representation Learning. arXiv, 2015. Yang Yang, Jimei Yang, Junjie Yan, Shengcai Liao, Dong Yi, and Stan Z Li, “Salient color names for person reidentification,” in ECCV, pp. 536–551. 2014. Yang Yang, Shengcai Liao, Zhen Lei, Dong Yi, and Stan Z. Li, “Color models and weighted covariance estimation for person re-identification,” in IAPR ICPR, Aug 2014, pp. 1874–1879. Venice Erin Liong, Jiwen Lu, Yongxin Ge, “Regularized local metric learning for person re-identification.” Pattern Recognition Letters, 2015. Mang Ye, Jun Chen, Qingming Leng, Chao Liang, Zheng Wang, and Kaimin Sun, “Coupled-view based ranking optimization for person re-identification.” 21st International Conference on Multimedia Modelling, MMM 2015. Yang Shen, Weiyao Lin, Junchi Yan, Mingliang Xu, Jianxin Wu, Jingdong Wang, “Person Re-identification with Correspondence Structure Learning.” IEEE International Conference on Computer Vision (ICCV), 2015. Ejaz Ahmed, Michael Jones, Tim K. Marks. ” An Improved Deep Learning Architecture for Person Re-Identification.” The IEEE Conference on Computer Vision and Pattern Recognition (CVPR), 2015, pp. 3908-3916. Liong, V.E.,Yongxin Ge, Jiwen Lu, “Discriminative regularized metric learning for person re-identification,” in International Conference on Biometrics (ICB), 2015. Sheng Li, Ming Shao, Yun Fu. Cross-View Projective Dictionary Learning for Person Re-identification. In IJCAI – International Joint Conference on Artificial Intelligence, 2015. Raphael Prates, William R. Schwartz, “Appearance-Based Person Re-identification by Intra-Camera Discriminative Models and Rank Aggregation,” in International Conference on Biometrics (ICB), 2015. Fei Xiong, Mengran Gou, Octavia Camps, Mario Sznaier, “Person Re-Identification using Kernel-based Metric Learning Methods,” in ECCV 2014. Mingyong Zeng, Zemin Wu, Chang Tian, Lei Zhang, Lei Hu. “Efficient Person Re-identification by Hybrid Spatiogram and Covariance Descriptor.” The IEEE Conference on Computer Vision and Pattern Recognition (CVPR) Workshops, 2015, pp. 48-56. Bingpeng Ma, Yu Su, Frédéric Jurie. “Covariance descriptor based on bio-inspired features for person re-identification and face verification.” Image and Vision Computing, Volume 32, Issues 6–7, June–July 2014, Pages 379-390. Rui Zhao, Wanli Ouyang and Xiaogang Wang. “Person re-identification by salience matching.” IEEE International Conference on Computer Vision (ICCV), 2013. Zhen Li, Shiyu Chang, Feng Liang, Huang, T.S., Liangliang Cao and Smith, J.R. “Learning Locally-Adaptive Decision Functions for Person Verification.” The IEEE Conference on Computer Vision and Pattern Recognition (CVPR), 2013. Ziming Zhang , Yuting Chen, Venkatesh Saligrama. A Novel Visual Word Co-occurrence Model for Person Re-identification. ECCV 2014. Rui Zhao, Wanli Ouyang, Xiaogang Wang. Learning Mid-level Filters for Person Re-identification. CVPR 2014. Yanbing Geng, Hai-Miao Hu, Guodong Zeng, Jin Zheng. “A person re-identification algorithm by exploiting region-based feature salience.” Journal of Visual Communication and Image Representation, Volume 29, May 2015, Pages 89-102. Dong Yi, Zhen Lei, Shengcai Liao, Stan Z. Li, “Deep Metric Learning for Person Re-identification“. International Conference on Pattern Recognition (ICPR), 2014, pp. 34-39.
equivalence constraints,” in IEEE CVPR, 2012. Rui Zhao, Wanli Ouyang, Xiaogang Wang. 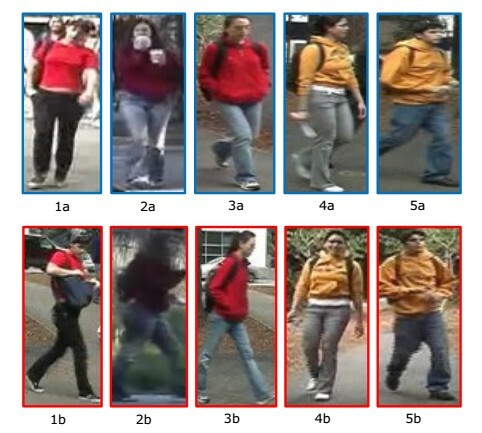 “Unsupervised Salience Learning for Person Re-identification,” in IEEE CVPR, 2013. Bingpeng Ma, Yu Su, Frédéric Jurie. “Local Descriptors encoded by Fisher Vectors for Person Re-identification,” in ECCV Workshops and Demonstrations, 2012. Qingming Leng, Ruimin Hu, Chao Liang, Yimin Wang, Jun Chen, “Person re-identification with content and context re-ranking .” Multimedia Tools and Applications, September 2015 , Volume 74, Issue 17, pp 6989-7014. M. Hirzer, P.M. Roth, and H. Bischof, “Person re-identification by efficient impostor-based metric learning,” in IEEE AVSS, Sept 2012, pp. 203–208. Farenzena, M., Bazzani, L., Perina, A., Murino, V., Cristani, M. Person Re-Identification by Symmetry-Driven Accumulation of Local Features. CVPR 2010. Wei-Shi Zheng, Shaogang Gong, Tao Xiang. “Person re-identification by probabilistic relative distance comparison,” in Computer Vision and Pattern Recognition (CVPR), 2011. Xiaokai Liu, Hongyu Wang, Yi Wu, Jimei Yang, and MingHsuan Yang, “An ensemble color model for human reidentification,” IEEE Winter Conference on Applications of Computer Vision, 2015. (*) These methods used a single-shot evaluating protocol. They randomly selected one of the probe images to rank the gallery. (*) These methods used a multi-shot evaluating protocol. They employed the two probe images available to compute the scores and rank the gallery images. Ejaz Ahmed, Michael Jones, Tim K. Marks. An Improved Deep Learning Architecture for Person Re-Identification. The IEEE Conference on Computer Vision and Pattern Recognition (CVPR), 2015, pp. 3908-3916. Sakrapee Paisitkriangkrai, Chunhua Shen, Anton van den Hengel. Learning to rank in person re-identification with metric ensembles. The IEEE Conference on Computer Vision and Pattern Recognition (CVPR), 2015. Ying-Cong Chen, Wei-Shi Zheng, Jianhuang Lai. Mirror Representation for Modeling View-Specific Transform in Person Re-Identification. In IJCAI – International Joint Conference on Artificial Intelligence, 2015. Ziming Zhang, Yuting Chen, Venkatesh Saligrama. A Novel Visual Word Co-occurrence Model for Person Re-identification. ECCV 2014. Wei Li, Rui Zhao, Xiaogang Wang. Human Reidentification with Transferred Metric Learning. ACCV 2012. Rui Zhao, Wanli Ouyang, Xiaogang Wang. Person re-identification by salience matching. ICCV 2013. Martinel, N., Das, A. , Micheloni, C., Roy-Chowdhury, A.K. Re-Identification in the Function Space of Feature Warps. PAMI, 2015. Bingpeng Ma, Yu Su, Frédéric Jurie. Local Descriptors Encoded by Fisher Vectors for Person Re-identification. ECCV 2012. Rui Zhao, Wanli Ouyang, Xiaogang Wang. Unsupervised Salience Learning for Person Re-identification. CVPR 2013. Schwartz, W.R., Davis, L.S. Learning discriminative appearance-based models using partial least squares. SIBGRAPi 2009. Niki Martinel, Christian Micheloni. Sparse Based Matching of Random Patches for Person Re-Identification. ICDSC, 2014. Hirzer, M., Roth, P.M., Bischof, H. Person re-identification by efficient impostor-based metric learning. AVSS 2012. Martin Hirzer, Peter M. Roth, Martin Köstinger, Horst Bischof. Relaxed Pairwise Learned Metric for Person Re-identification. ECCV 2012. Bingpeng Ma, Yu Su and Frederic Jurie. BiCov: a novel image representation for person re-identification and face verification. BMVC 2012. Tamar Avraham, Ilya Gurvich, Michael Lindenbaum, Shaul Markovitch. Learning Implicit Transfer for Person Re-identification. ECCV 2012.